It was a bright sunny crisp morning. Great weather for cycling and I made really good time following the river South from Dumfries and then West along the coast towards Gretna. For once I had the wind at my back and I was in Gretna by lunch, feeling fresh and strong. From there I hopped over the border and headed South again to Carlisle for a spot of carb-loading in an Emperor Hadrian themed Italian restaurant before tackling the Lake District National Park. I bypassed the mountains of the Northern Lakes, crossing the A66 and entering the park at Matterdale. An hour of hills later and I was slightly perplexed to be approaching the A66 again. Apparently there are two Troutbecks in the Lakes, leading to me taking a wrong turn and doubling back on myself. Extra miles I definitely didn’t need. I headed back into the park, climbing once more before taking the correct route and the steep descent to Ullswater where the heavens opened. 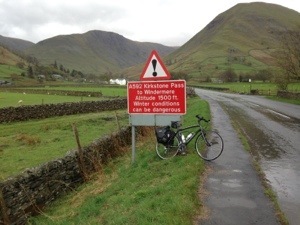 A few miles later and I was at the foot of the Kirkstone Pass for the climax to leg one. It was really steep, and really tough but not so bad as I imagined. I realised at the top that of the three routes there, that only one (the road to Ambleside) is ‘the struggle’. Oh, good. I can save that pleasure until next time. 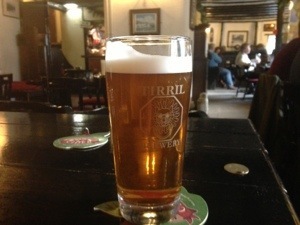 The Kirkstone Inn at the very top is Britains highest pub, and a pint of beer has never tasted sweeter. The downhill on the other side was incredible. Are you familiar with the concept of earworms? You know, those songs you just can’t shift from your mind? The repetitive action of cycling provides a fertile breeding ground for earworms, and once they are in there they are hard to dislodge. Up in John O’Groats Tim told me about getting Agadoo lodged in his brain whilst cycling. I have been on my guard against that particular one ever since. For some reason today I had Remember you’re a Womble going round and round in my head all the way from Carlisle to the top of the Kirkstone Pass. I had two very good reasons for needing to be in the Lakes by Friday evening, as they were coming to meet me for the weekend from London. The first one is called Chloe, and the second will be making his first public appearance in a few months time. He doesn’t have a name yet, but after today Orinoco is officially on the short list.